Contact new prospects and generate leads. Promote your company’s image and maximize its market exposure. Discuss the needs of your customers face-to-face. Launch new products or services at the dealer level. remains constant: Our attendees still want to see, touch and talk product…face-to-face! 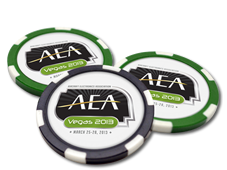 Let your customers & prospects know where to find you at the AEA Convention. Add "See you at" logos to your website, email and print advertising! Check with the AEA for any remaining openings!